Girl has taste—designer taste, that is! It's true what they say, there's more to design than what meets the eye. While it's easy to admire the things you see immediately, it's the story behind the choice of furniture and decor that makes a difference. We shouldn't also forget the little details that make a home stand out—it can be a tiny tabletop decor or a piece de resistance that ties the look together. Heart loves sharing photos of her new home on Instagram. We were able to get a peek into her property from the construction stage down to the finishing touches. These Hermès pillows are perfect must-haves to spruce up her sofa. Hints of gold add a touch of sophistication to the space while the details provide interesting textures. If you love colors and patterns, there are different options for you to check out! Click here. Would you also serve sweets and tea using a similar bar cart? When not in use, it can hold a vignette or even work as an accent piece on its own. Find a similar gold bar cart at Crate & Barrel, SM Makati, Courtyard Dr, San Lorenzo Village, Makati City. Heart recently hosted a dinner party and the most beautiful plates were brought out. The plate is from the Hermès Cheval d' Orient line of porcelain. The collection features ornate designs and details inspired by horse harnesses. Aside from the dessert plate, the collection also has a round tray, a large vase, tea cups, and saucers. Click here to learn more. To complete the setup, Heart set the dessert plate on top of Haute Home Manila's Aurora Coral Plate Charger in Gold. The colors look perfect against the wooden table. 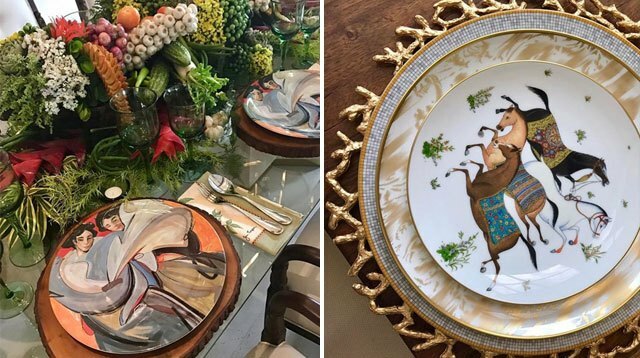 Haute Home Manila offers handmade and hand painted must-haves. Follow them on Instagram. How pretty is this table setup? The Fornasetti plate takes the spotlight—with the red roses serving as a fitting backdrop. And if the plate isn't enough to capture your attention, the utensils were set on top of Givenchy table napkins. To keep a wall from being too dull, a trio of Fornasetti wall plates were put up. We especially love the one in the middle with its gold finish. The woman whose face is always seen on Fornasetti plates is Lina Cavalieri, an Italian singer. While some would often forget about table napkins, it's one of the stars in this setup done by Heart's cousin Happy Ongpauco-Tiu for a gathering at home. The Jim Thompson table napkins work perfectly with the artsy plates and also complement the wooden pieces. Featuring beautiful fabrics in various designs and colors, these pieces are used in many bars and restaurants. Click here to learn more. Talk about having coffee and welcoming another day in style! Aside from the plates and wall decor, Heart also has charming Fornasetti tea cups with matching saucers. Original Fornasetti pieces are available at La Maison Deco, Unit G04 Robins Design Center Building, #31 Meralco Avenue, Pasig City. Follow them on Facebook. To learn more about Fornasetti, click here.